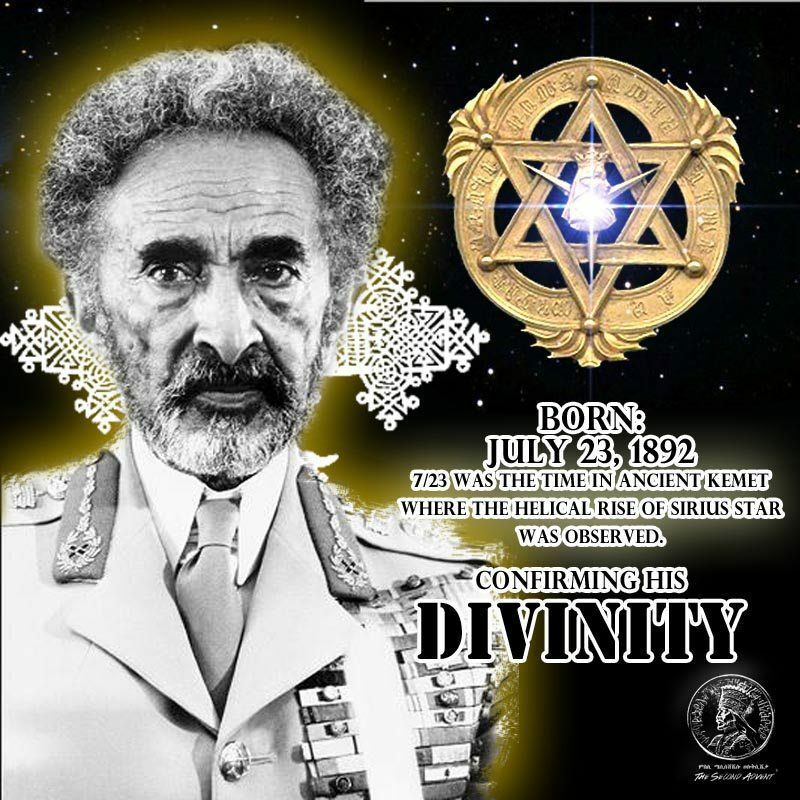 Video: July 23 2011 Emperor Haile Selassie I is @ 119 years of age this age revels the source of the 11:11 :11 phenomenon; In commemoration of the 119 birth day celebration of The King of Kings conquering lion of the tribe of Judah we bring you this following presentation July 23 2011 the sun enters the sign of the lion Leo – It is exactly 111 days from 7/23/2011 to 11/11/2011 so here, we give you another view of information we found. July 23, 2010 commemorated the 118th earth day of Emperor Haile Selassie of Ethiopia. Selassie born on July 23, 1892 ignited a global tidal wave of African pride and consciousness upon his coronation on November 2, 1930. The image of Negus Haile Selassie instigated an appreciation of things African and propelled people of African ancestry to a heightened awareness of their divinity. Haile Selassie propitiated the image of God, identity as well as the world stage, where he highlighted Ethiopian interests and brought forth the natural mystic latent in places that received his message. The structure of society can be viewed as a religious text, that is bound by” liturgical and devotional forms of worship of mainstream faith”. The “mainstream faith” of the majority of the world was white supremacy. The oppression that people of African ancestry faced was a detailed experiment in complete subjugation. It was the epitome of spiritual warfare. There was not one aspect of society that white supremacy was not felt, it was a demonic exercise in the elimination of having any positive relationship to their ancestral place of origin. Racism, colonialism and imperialism were carried out with religious zeal and its practice was inextricably tied to the worship of the white man’s God. The white race was not content with just the physical enslavement but required through its laws and customs that the conquered people follow the tenets of white man’s religion, which maintained that God is white and Blacks were not worthy of being represented in God’s image. This is seen in all of the Western religions where the white image prevails from Adam, Muhammad (PBUH) and to Jesus Christ. White supremacist propaganda was successful in a large part in eroding confidence in African traditional spiritual concepts and practices, which left the majority of African people seeking God outside of themselves. Selassie provided a break from “the liturgical and devotional forms of worship of mainstream faith” which was in effect the religion of white supremacy. Unlike Garvey who led an organization, the UNIA, the most successful mass organization of people of African ancestry the world has witnessed, Selassie was in fact a “King” in charge of his own land. For many people of African ancestry who did not have political representation of any meaningful consequence during the 1930s, the image of an African Head of State who also claimed lineage to one of the greatest figures in the Western religion canon shook them out their slumber of blind admiration of the white race. As “His Imperial Majesty Haile Selassie I, King of Kings, Lord of Lords, Conquering Lion of the Tribe of Judah, and Elect of God” and stating he is of the lineage of King Solomon and the Queen of Sheba, Haile Selassie called African people to bring forth their natural mystic from within, as seen with the Rastafarian movement. The Rastafarians whose origins are rooted in the legacy of Haile Selassie, assert that his coronation was prophesied by the Honorable Marcus Garvey and that it was a sign of the “quickening” of African liberation. To many in the Rastafari movement , he is the incarnation of Jesus or God. Other groups in the African Diaspora saw Haile Selassie as vindication to the image of the Black race, who were told by all the institutions of power in the Western world, that they were inferior and were not worthy of anything connected to ”civilization”. Question: Why Does Google Sky Block Out The Sirius Star unless there is some image/scene being hidden? To others they view his legacy as one that is flawed and unfortunately, not truly understood by many who claim they respect and love Selassie. Nevertheless despite the varying perceptions about Haile Selassie, it is clear that he inspired many to look to Ethiopia and Africa in general with admiration instead of contempt. It may be the case that Haile Selassie may be better appreciated outside of Ethiopia than in his native land. Haile Selassie was excellent at international relations and it is in that arena that we can readily identify his impact. Selassie in his travels outside of Ethiopia made a lasting first impression in Europe, Africa, America and Jamaica. Haile Selassie was also displayed acumen in using the international stage to rally the world to the side of Ethiopia and show his support for freedom and justice for all. This is seen with the mobilization of African-Americans support of in Ethiopia’s fight against Italy. Tseday Alehegn of Tadias Magazine in his article “African-American & Ethiopian Relations” informs us that African-Americans travelled to Ethiopia, since March 1, 1896 with Ethiopia’s victory over Italy, which marked the first time an African country defeated a colonial power. “By the mid 1930s the Emperor had sent a second diplomatic mission to the U.S. Vexed at Italy’s consistently aggressive behavior towards his nation, Haile Selassie attempted to forge stronger ties with America. Despite being a member of the League of Nations, Italy disregarded international law and invaded Ethiopia in 1935. The Ethiopian government appealed for support at the League of Nations and elsewhere, through representatives such as the young, charismatic speaker Melaku Beyan in the United States. Beyan had married an African-American activist, Dorothy Hadley, and together they created a newspaper called Voice of Ethiopia to simultaneously denounce Jim Crow in America and fascist invasion in Ethiopia. Joel Rogers, the correspondent who had previously attended the Emperor’s coronation, returned to Ethiopia as a war correspondent for The Pittsburgh Courier, then America’s most widely-circulated black newspaper. In Harlem, Chicago, and various other cities African-American churches urged their members to speak out against the invasion. Beyan established at least 28 branches of the newly formed Ethiopian World Federation, an organ of resistance calling on Ethiopians and friends of Ethiopia throughout the United States, Europe, and the Caribbean. Although the United States was not officially in support of Ethiopia, scores of African-Americans attempted to enlist to fight in Ethiopia. Unable to legally succeed on this front, several individuals traveled to Ethiopia on ‘humanitarian’ grounds. Author Gail Lumet Buckley cites two African-American pilots, John Robinson and the ‘Black Eagle of Harlem’ Hubert Julian, who joined the Ethiopian Air Corps, then made up of only three non-combat planes. John Robinson, a member of the first group of black students that entered Curtis Wright Flight School, flew his plane delivering medical supplies to different towns across the country. Haile Selassie’s other efforts in the international arena include his 1936 Address to the League of Nations and his 1963 Address to the United Nations Assembly. It was his address at the United Nations which inspired the song “War” by Bob Marley. No where did the presence of Selassie captivate and take root than Jamaica. The impact of Selassie’s visit to that country in 1966 still reverberates in the annals of Reggae music with artists such as Peter Tosh, Bob Marley, Bunny Wailer, Burning Spear, Etana and Queen Ifriyika. Married his wife Empress Menen Asfaw on August 3, 1911. August 3, 1911=8+3+1+9+1+1=23=2+3=5. 500 acres set aside for Shasamane Land settlement. After the failed assassination attempt against Graziani on February 19, 1937, the Italian colonial authorities executed 30,000 persons, including about half of the younger, educated Ethiopian population. February 19, 1937=2+1+9+1+9+3+7=32=3+2=5. Meeting in Ethiopia at Addis Ababa, 32 African countries signed the Charter to the Organization of African Unity 1963. Haile Selassie speech to the League of Nations on June 30 1936 in Geneva: 6+30+1+9+3+6=55. Emperor Selassie I left Jamaica on Sunday, April 24 1966. April 24, 1966= 4+2+4+1+9+6+6=32=3+2=5. In Kemet/Egypt Sirius rose in alignment with the Sun marking a new year as well as the annual flooding of the Nile/mourning of Auset (Isis). Haile Selassie had six children: Princess Tenagnework, Crown Prince Asfaw Wossen, Princess Tsehai, Princess Zenebework, Prince Makonnen, and Prince Sahle Selassie. Selassie was deposed from his throne on September 12, 1974: 9+1+2+1+9+7+4=33 or 6. Haile Selassie speech to the United Nations on October 6, 1963: 10+6+1+9+6+3=35=3+5=8. H.I.M. Emperor Haile Selassie arrived in Jamaica on April 21, 1966: 4+2+1+1+9+6+6=29=2+9=11. Selassie was the heir to a dynasty that traced its origins to the 13th century. At age 13, Selassie received the name “Dejazmach” which means “commander at the gate”. May 25, 1963 Organization of African Unity formed in Addis Ababa Charter Organization signed by 32 countries. May 25, 1963=5+25+1+9+6+3=49=4+9=13. The year 1936 , in which he gave his speech against Italy’s aggression: 1+9+3+6=19. The year 1963, where he convened the OAU meeting and gave his speech at the UN assembly which inspired the song “War” by Bob Marley: 1+9+3+6=19. The meaning of these numbers will be examined at a later time. This article was a brief introduction to the impact of Haile Selassie on the world. His “earth day”/ birthday on July 23, 1892 was the coded reference on how his life would be instrumental in the rise of African people from the depths of oppression. July 23 was the time in Ancient Kemet where the helical rise of Sirius star was observed. Sirius rose in alignment with the Sun marking a new year as well as the annual flooding of the Nile/mourning of Auset (Isis). Hence Selassies’s birth signaled “the new year” of African liberation. African people concerned about their liberation “connected the dots” and never forgot the words of the Honorable Marcus Garvey who urged his followers to look to Africa for the coronation of a king. They saw fulfillment in Garvey’s words, when Selassie was crowned on November 2, 1930. As a head of state of an independent African country with a rich history recorded throughout the ages, who could claim direct lineage to King Solomon, provoked an awakening amongst African people. This was the case for those who were followers or sympathizers of Marcus Garvey and the UNIA. The oppression that African people faced was in effect an example of demonic spiritual warfare where the image of God itself was the depiction of the oppressor. Selassie as an international symbol of African cultural consciousness released the natural mystic within African people which connected the image of God, elevated sense of identity and a relationship to land base, Ethiopia in particular as well as the entire continent of Africa. White supremacy is in itself a religion and a form of spirituality. Selassie was able to continue the work of Garvey and bring Black people to look within and let their natural mystic naturally flow. As seen with the Rastafari movement and Reggae music we see the impact of the symbolism of the Selassie legacy still lives on.